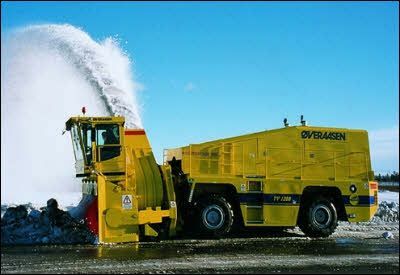 We thought we would do a fun post about Really Big Snow Blowers, since there seems to be a lot of interest in this type of snow machine. If you are actually looking for a large snow blower for your own application, check out the categories and select the size that you are looking for. We are reviewing as many as we can on our blog and adding more every month. Soon we will start adding more for the coming winter season, however we wanted to write this post while it is still summer time and warm. The snow will come soon enough! There are lots of commercial snow blowers that are really big, but we thought we would start with one that really caught our attention. This guy was trying to clear snow along a road in North Dakota. the snow is almost too deep for this type of plow to move the snow. Sometimes road authorities have no choice but to go with a large commercial snow blower . 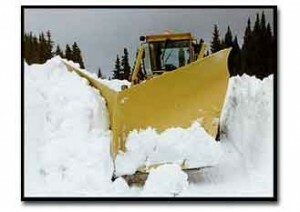 A plow cannot move the snow far enough off the road. The plow cannot move this huge wall. This one was a great picture to show just how deep the snow can get in the winter in North Dakota. However if you thought this was bad, check out the road in the next picture. This road is a virtual tunnel through the snow. The snow is so deep that you have no choice but to use a snow blower to open the road and you hope there are no cars stuck in the snow along the road. Just look at that snow. You can barely see the tops of the trees beside the road. The instant there is a little bit of wind and this road will fill in with snow in a matter of minutes . If you look closely there is a car traveling along the road towards you. The height of the walls dwarfs the car. There is also a line up of cars going in the other direction. They seem to be waiting for something to let them through. Could be either the snow blower working to clear the road. Or more likely a spot where the road is only one lane due to the snow conditions. This is a really amazing picture. This is an extreme snow condition in the Dakotas and other areas around the mountains were they routinely get a lot of snow. So what kind of machine do you need to clear snow off roads like this. Here are two pictures of the type of machines that are needed. The first one shows the commercial snow blower machine in profile clearing a little bit of snow along a road. We think this was just a demonstration picture to show the machine in operation. These machines clear snow along city streets as well. They will blow the snow directly into a waiting truck. It is left in a snow dump to melt in the spring. The next picture shows snow clearing operations that were probably along a road like the one we showed earlier. There is just no way a car or even a big truck could get through this road until it is cleared. The snow blower machine risks getting stuck in the snow. Where is the road? Can you imagine driving this machine in these conditions? I hope this guy has a radio or a working cell phone. Blowing snow will quickly cover your vehicle. If you liked this post , let us know. If you have your own pictures that you would like to send us, leave us a comment. We will try to add them to our blog. 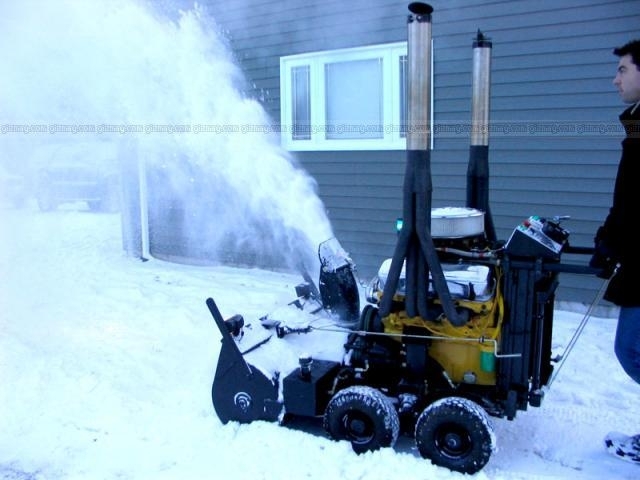 For more posts about unusual snow blowers, click here. This post is about clearing snow in North Dakota. Our web site normally focuses on snow blowers and reviews of them. We try to give our readers a summarized view of all of the snow blowers on the market so they can come to one place and see the various types of snow blowers. This post and the one before it is a departure for only two posts, because we were just amazed by the pictures and the amount of snow involved, the machines that are needed and the impact it has on peoples homes. 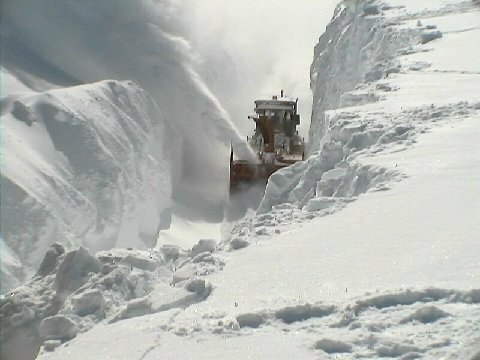 In some areas of the country were they receive a lot of snow, they have to find significant ways to deal with the snow like this large snow blower above. 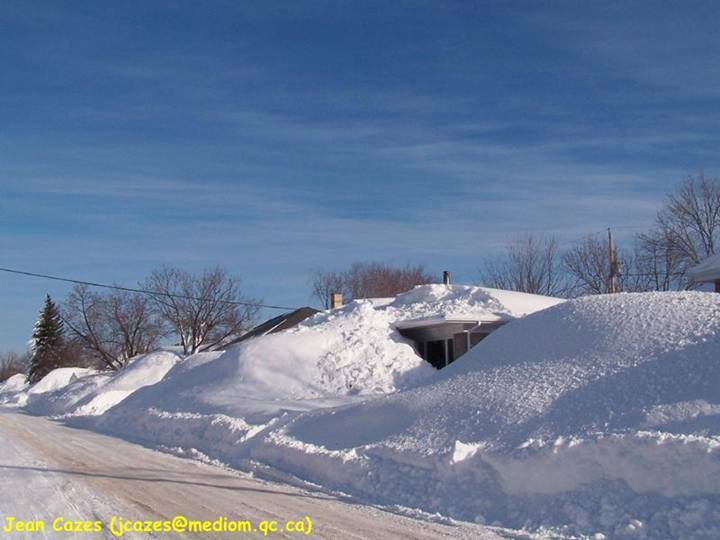 Homeowners must be ever vigilant about the snow load on their roofs and regularly remove snow to avoid collapse. 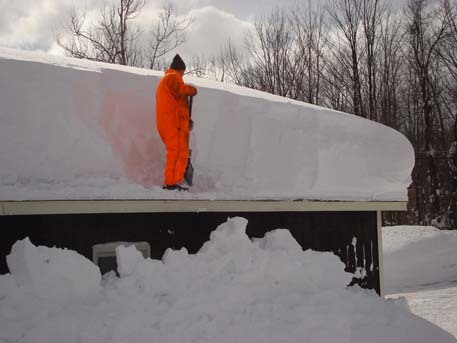 snow banks are higher than your machine and you are already sitting over 15 feet in the air atop your massive snow blower. Of course there is always the danger as well of hitting a car that has the unfortunate luck to be buried in the snow long this road. With snow banks like these, it will not take much for this road to be filled in once again. Not even a small storm will be needed. Just some blowing wind will fill this road in within a matter of hours. The finished road is shown on the right with a car driving down it. A nice sun shiny day somewhere in the middle of north Dakota in the winter time along a road that was only recently opened! This was obviously taken in the country, however homes in North Dakota had to endure the huge amounts of snow as well. risk his roof caving in onto of him some night. That is a lot of snow and there were probably many roofs that caved in. especially from anywhere that the water could penetrate into your home on the main floor or in the basement. 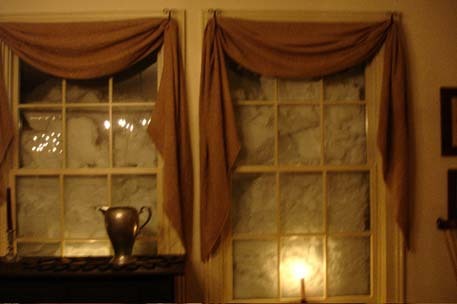 The picture on the right shows how much snow has built up around the house and against the windows. What a pile of snow! Hope you enjoyed the pictures and the comments. Feel free to add your comments about the snow in your area of the world! For more unusual snow blowing stories, click here. 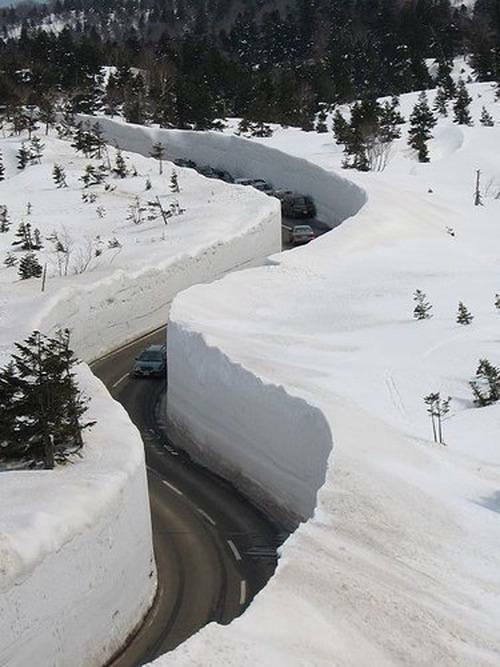 The winter in North Dakota was unbelievable this year in 2011 and the pictures we came across that we found on the web that were freely circulating are just unbelievable. Snow Clearing in North Dakota can be much more challenging than many other locations. 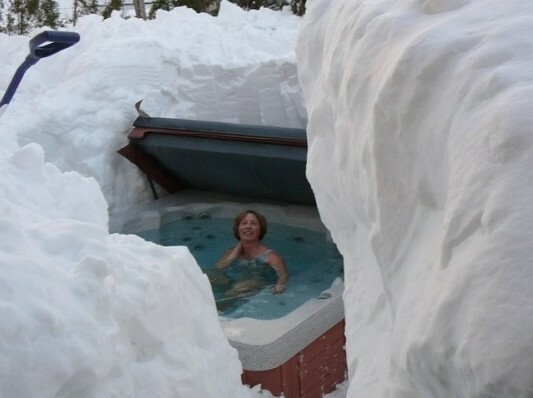 This picture shows a women in her hot tub with mountains of snow around her. Imagine the work they had to do just to get this picture! The hot water from the hot tub would help to melt the snow, but whoever had to do the shoveling had a lot of work to do. This is a picture to remember and we are sure that they will have this one on display for many years to remember the great snow storms of the winter of 2011.
picture. This is truly a huge snow blower that is only used for heavy snow falls in mid winter when no other machine can deal with all of the snow. If you live in the southern US or even southern Canada, you might not ever see one of these machines at work. Hopefully you will not have to see one. In the mountains or in the mid west where they receive a lot of snow there is a good chance you will see snow that requires one of these machines. These snow blowers are only meant for serious extreme snow conditions and that is why we included these pictures on our web site! these kinds of snow blowers. Imagine driving in these road conditions or having to blow snow from these roads. Were is the road in the first place and are there cars buried in the snow along the road somewhere? How does the snow blower driver even know where the road is. How does he stay on the road without ending up in the ditch. 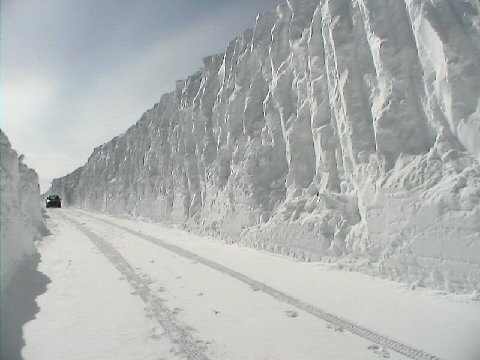 Just look at the car on the road relative to the side of the wall of snow along the road. This road was cleared after the snow storms were over, I cannot imagine what it would be like having to exist during a snow storm in this area. driveway in this area. These people have to also remove snow from their roof to avoid the roof caving in. The weight of the snow on the roof can be very heavy. A roof can hold a lot of weight without caving in. But sometimes the snow becomes soaked with rain water which can happen sometimes in a warm spell. The combined weight will be too much for the roof and down it goes. Our next post will show some more pictures of this same storm and road conditions in the North Dakotas in the winter of 2011. We will post it in 14 days so watch for it to see the next set of pictures. If nothing else, it should make you appreciate the summer time that much more! Enjoy the summer months and get prepared for the next winter that might dump tons of snow on the Dakota’s. The rest of us can be thankful that we do not have to live with this kind of snow. For more interesting stories about unusual snow blowing conditions, click here. Every once and a while we come across some unusual pictures of snow situations in other countries. We thought our readers might enjoy these pictures and perhaps appreciate just how easy we have it compared to these people. This one is Snow Clearing in Russia and shows what they have to deal with in some areas of their country where they receive lots of snow. This situation takes major snow clearing equipment to open the road, only to have it fill in again during the next snow storm. You wonder why they even bother to reopen the road with these kinds of conditions. This must be the only road into a town or perhaps between towns. Can you imagine getting stuck in one of these snow canyons during a storm. You would have to come back in the spring to get your car when the snow melted and that is if the back hoe did not damage it when they were re-0pening the road. If there is any wind at all, the snow will fill in this road and this road will be impassable within a few minutes, Any driver would quickly get stuck in the snow even if you have a four wheel drive vehicle You never want to be caught in a snow canyon like this one. Amazing! This is what the road looks like once it is open and the snow clearing equipment has completed their work for the most recent snow storm. With a little wind and some blowing snow this road will fill in again within a matter of minutes. I sure would not want to be stuck anywhere near this snow tunnel. This is actually a potentially very dangerous situation to be in if your were on this road. Anyone traveling in these conditions should travel with survival gear. Be prepared to be able to walk out if their vehicle were to get stuck in the snow. When you think about it, most people would have a difficult time just trying to climb out of this tunnel to the top. Your vehicle is stuck and you cannot even get out of this snow tunnel. We really like adding these posts to our blog. They show what other people have to deal with in various parts of the world. These pictures are from Russia. However we expect that people living in the Canadian Rockies and in the US Rockies must have to deal with some of the same conditions. 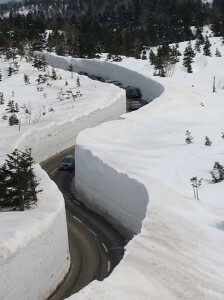 We have heard of snow tunnels like this on North American roads. However have not yet seen any pictures that come close to these. We think they are out there, and if you have some, why not send them our way via comment. Perhaps in the Rocky Mountains of western Canada or in the north western part of the United States will have conditions like these. We also suspect that some railroads also have to face this kind of snow conditions. These conditions exist in the mountains or heading through valleys were the snow really fills in. Let us know. The snow is actually quite dangerous if your car is on the road with these conditions and snow valleys in the road which is like a valley between the snowdrifts. Be very careful when you’re driving these kinds of roads. If you cannot see where you’re going, turn around and go back. If you have pictures like these or know of situations in North America, please send us your pictures via comments on our blog and we will add them to our blog for readers to view. Amazing snow conditions! For more unusual snow blower posts, click here. 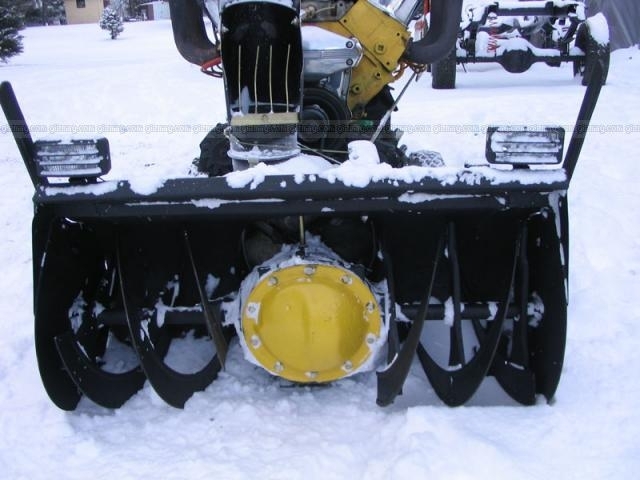 This is a real powerful snow thrower, however we cannot claim this as our own. In fact we don’t even know who originally sent this story around on the internet. But it is so interesting and obviously different. 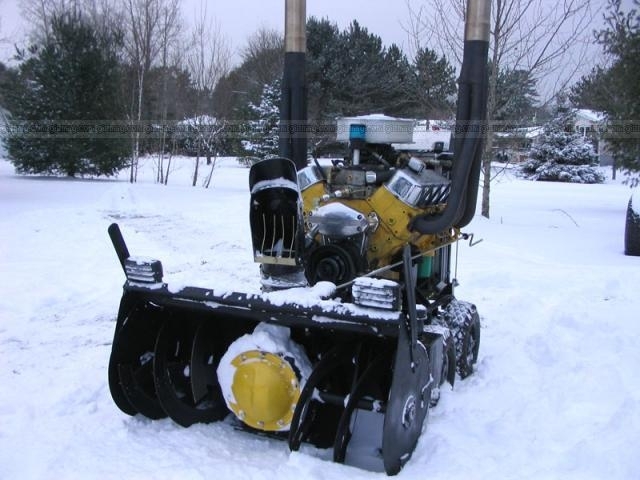 We just had to include a post about this unusual snow blower or should I say snow THROWER! Hope you enjoy. If you’re tired of anemic, one-lung snow blowers with their slipping drive belts, you might consider Kai Grundt’s V8 snow blower which raises the bar on the traditional snow blower in every respect. With electric start, electric block heater, antifreeze heater and eight cylinders, it has no drive belts to freeze up and you’ll never get bored with the job as the 454 cubic inch big block Chevrolet V8 produces 412 horsepower, 430 foot pounds of torque and can throw snow 50 feet at just 3500 rpm. Nor will you get cold. 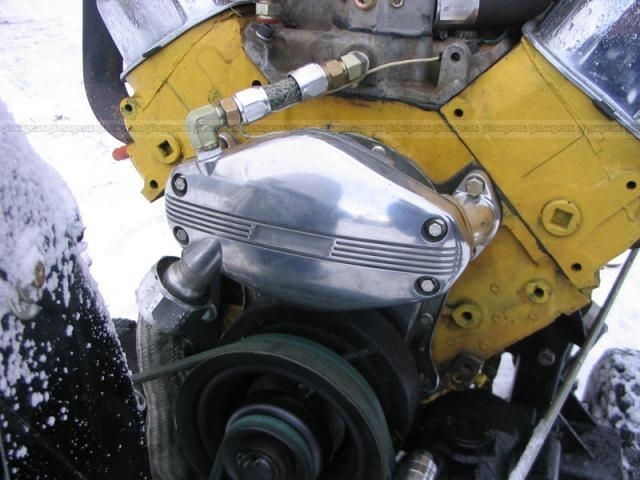 The machine has been ingeniously designed to route the engine coolant through the handle bars. The rear mounted, enclosed radiator keeps the operator nice and cozy. Maneuvering the massive beast (it has a total wet weight of 912 lbs) is a breeze. Thanks to the hydraulic-drive 4WD skid steering on independent walking beams. Which offers a zero turning radius. It’s also as fast as you like. It has an infinitely adjustable speed range on the drive wheels via dash mounted flow control. At the opposite end of the scale, it has more than enough torque to pull your car out of the ditch before the hydraulic motors stall. Add to the well-balanced feel of the unit, just 15 pounds of down force on the handlebars will lift the auger blade off the ground. It is easy to climb stairs/walkways for ease of snow removal. Safety has and continues to be paramount with spring return to center “fail safe” type directional controls with emergency stop and tether cords. Safety is one of the key themes, with a flashing blue light being the least of the safety features. No-one will fail to hear you with those twin throaty exhaust. Which come standard with 92 decibels at the controls. Though if the rumble of a V8 exhaust is music to your ears, you can obviously go much louder. Even at the standard baffling, hearing protection is strongly suggested. The powerful yard machine lights and a dashboard with back lit gauges complete the package. The custom 42 inch, two stage auger has a Chevrolet 10 bolt truck differential with spool and a centrifugal auger clutch with shear pin protection, further adding to the image of this “automotive theme blower.” Each unit is custom-built. Optional extras for the snow blower are both diverse and outrageous as the base unit. There are unlimited auger choices from single to multi stage designs.